This four-person picnic backpack from Picnic Plus is so jam-packed with dining features it would make Martha Stewart's jaw drop. 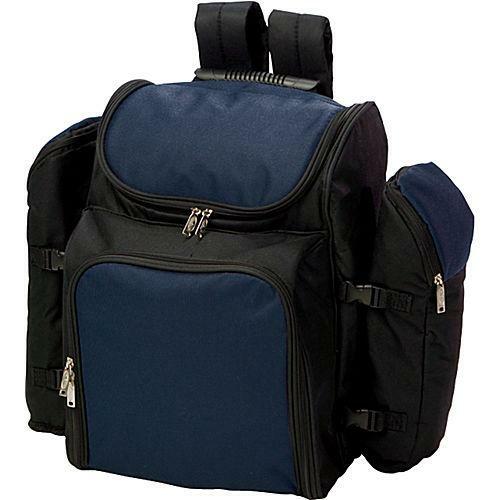 Whether you're looking for flatware, napkins, or a bottle stopper, this sleek-looking backpack has what you need, all contained in a handsome backpack that can be easily carried to your picnic destination of choice. Well, don't know first hand because it was purchased as a gift for a wedding I was unable to attend. The bride RAVED about it. They had already used it once when I received her note and were going to use again shortly. She thought it was a unique and romantic idea. I love my new Picnic backpack. I thought it would be a lot heavier than it looks, but it wasn't. We bought the navy blue. It had everything we needed for our camping picnic. I bought one for my son and his wife last year and they loved it. My daughter said she wanted one, so I ordered it for her for Christmas this year. Absolutely love it! Truly above and beyond my expectations! This picnic 'basket' is the best - and even better considering the price. It has all the bells and whistles anyone could need. And, all the pieces are easy to clean. The bottle holders not only snap in place, they also have velcro to keep them stable. And when traveling by air, we were able to transport bottles in the holders packed and checked without a problem. Don't forget to put the cork screw and silverware in your checked bag so they don't get confiscated in the security line. 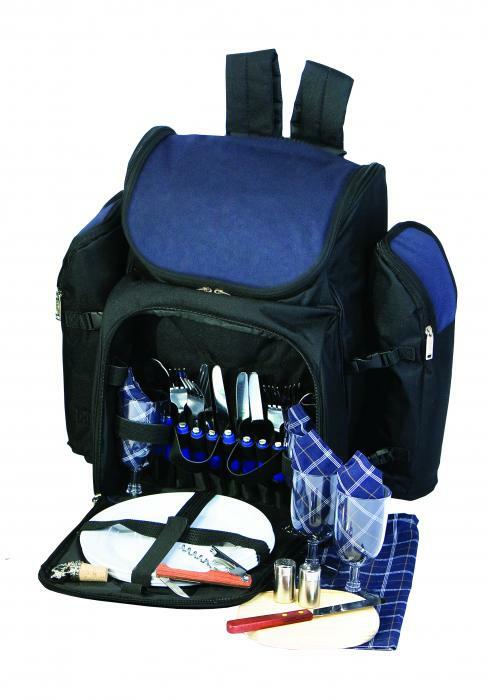 I ordered 2 of these picnic backpacks, one as a gift, and one for myself. It made a great anniversary gift and the couple loved it. It's great for anyone who loves the outdoors. The product came on time and the quality was very good. I purchased the Tandoor 4 person backpack for a wedding shower gift. I wasn't able to attend the shower but I heard it was the hit of the shower and the most unique gift. Was everything we were looking for . We gave it as a gift to our son and daughter in law. They loved it. We like the idea of the two beverage carrying compartments. Purchased for a wedding gift - I added two bottles of wine. A big hit with bride and groom and for all who saw the gift as well. Great quality and good looking! This backpack allows you to put everything in one handy portable container, it has lots of space for food, but does get heavy when full. I LOVE it and plan to put it to good use this summer. 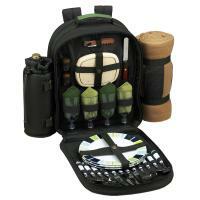 Great product, solid made, everything is organized and just right size for four people. Don't buy any other backpack. The item was exactly how it was described and pictured on the web page. We have used it and found it to be very "user friendly" with everything organized very logically and very accessible. We love it! It was a struggle after moving to northern Virginia to make it to the beaches in the area with a regular cooler. This is a wonderful product and exactly what we needed! It is on the beach every weekend with us. The dishes and silverware is top quality, and it will hold two bottle of wine in the extra pouches on the side. Everything stays cold and delicious! Thank you! It is excellent and very functional! It's awesome! This has everything you need to serve up a great picnic. It's good quality, and I especially like the small tablecloth that comes with it. Fits my little picnic table perfectly! I bought the backpack as a wedding gift but decided to keep it for myself. There is plenty space for food and for drinks. The quality is excellent and I receive lots of complements. Thanks for bringing style back to picnicking. A couple picnic menus would be nice touch. It is perfect for the more "active" picnicker! 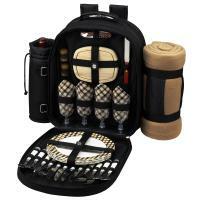 This wine backpack is simply amazing! I would highly recommend it to anyone interested in taking some wine on their picnic, and the fact that it holds two bottles is all the better! We bought this as a gift. It is very cool, has everything you need and more. These were gifts but fulfilled all my expectations. It is not too heavy and fits plenty of picnic food! We bought this as a wedding gift for a couple that has 2 children. We filled it with a small ham, a jar of peanut butter, crackers, 4 boxes of chocolate, a bag of dried fruits, a can of nuts, a bag of beef jerky, and 2 bottles of wine. The couples thank you note said... "what a unique gift. Loved all the goodies in the picnic bag". So over all, I was pleased. If I bought one for myself, I would choose a darker color, although the maroon will stand out and be easy to find. This is a lovely product, as nice as you expect it to be from the pictures. I gave it as a wedding gift and my friends seemed sincerely very happy to receive it. I really liked this bag. So far so good. It made a trip with me to the Hollywood Bowl and served us well. I was able to fit two wine bottles, four sandwiches, and a pound of grapes and strawberries. I adore my backpack cooler!! I took it out filled to the brim with bottles and food and it was still light and most importantly, COMFORTABLE when carried. The removable liner was a plus when cleaning, also. This is a great purchase! 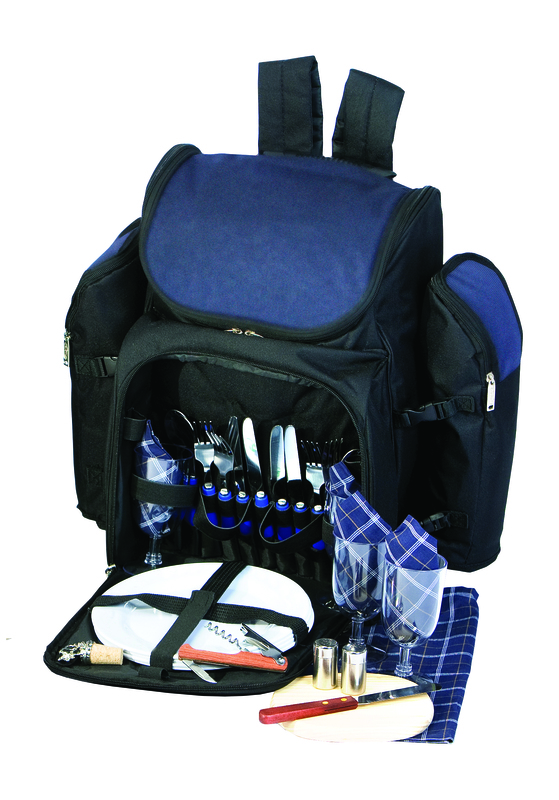 The Tandoor 4 Person backpack is the perfect size for a picnic lunch. There is plenty of space to pack all kinds of goodies in the cooler section of the bag. 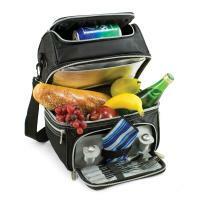 It comes with everything you need to have an enjoyable snack or meal on the go. It's a lot of fun! 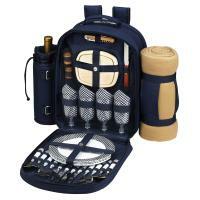 This is a great picnic set! It has plenty of rooms to pack all of your food in the insulated compartment and store your beverages in the side pockets. The plates, glasses, and silverware are nice - and you don't have to worry about them blowing away in the wind like with paper plates, etc. I am really glad that I bought this! This backpack had everything necessary for a wonderful picnic. I like the fact that it could carry two bottles of a beverage. I had one with water and one with wine. The utensils are very sturdy and look nice. I was able to put plenty of food inside the backpack as well. It gets heavy when really loaded down, but that's to be expected. Overall, I could not have asked for more in a picnic backpack. We bought this backpack for picnics in the park. It works great, keeps the food and wine chilled nicely. We have received many compliments on it. It is constructed very well and has ample storage room. We replaced the cheese board that comes with the set. It is great for nice picnics in the park or beach. 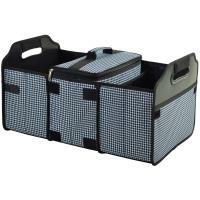 It is a nice compact picnic basket with handsome color-coordinated plates. Overall quality is good for the money. The plastic plates are light and small. I am very pleased with the picnic backpack we ordered. It came within only a few days. We found the backpack to be in perfect condition and to look the same as in the picture and contain all the items and features as described. The price was also the best price we could find out there. I have already recommended this site to others. Love it! Just wish the quality of the plates, utensiles & glasses was better. I was seeking a gift for some cousins and did not want to do the ordinary. A couple of years ago, I found a similar product with service for 2 instead of by 4 and gave one to my brother and one to my sister (they still use this all of the time.) I was looking for something practical, not outrageously expensive and could be used time and time again. I found it. This item is great. The only thing that could be better is if the food storage area was a little wider, not as narrow. Great item! Came quickly and we used it a few times already. Fits two bottles of wine and all the snacks you need! The only thing I was bummed about was that the cheese board broke in half the first time we washed it in warm water. I'm still waiting for a replacement that I requested a few weeks back. Besides that, we are very pleased with it and would recommend it! It is wonderful had almost everything! It is a nice item, good design and I would recommend it. This product was purchased as a gift for someone. Having not used it myself, I cannot rate it in that regard. It did, however, look like the picture and the pieces all looked like they were the expected quality.